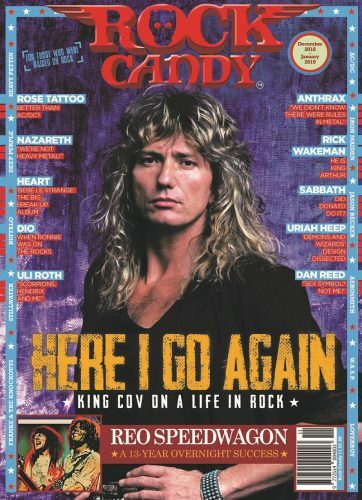 David Coverdale is on the cover of the latest issue (December 2018 – January 2019) of Rock Candy magazine, with a 14-page feature inside. The interview is structured around David commenting on the photos from his career, starting all the way back in 1969. That was taken at Clearwell Castle in the Forest of Dean in Gloucestershire the day it was announced that I’d joined Deep Purple. I’d turned 22 the day before. I think it had already been announced that Glenn Hughes was in the band, but nobody knew who they were getting in as a lead singer. The management or record company brought a bus or two of journalists up from London. It was a big deal. I’d auditioned for the band that summer at a place called Scorpio Sound Studios in the basement of Euston Tower in London – the Capital Radio building at the time. I was really nervous, because I hadn’t even made a record at that point. I’d brought a bottle of Bell’s Whisky down from Yorkshire as it was the best I could afford. But the friend who’d driven me down had stashed it for fear that I might get too pissed! But the Coverdale nose knows, of course, so I found the stuff immediately, and Jon Lord and Glenn Hughes assisted me in swigging it from the bottle. Jon sat and talked with me and really calmed me down. He became an amazing mentor and a dear, dear friend. I grew up with a Formica table in the kitchen, with a bottle of sauce on it and mix and match cutlery. Then the next thing you know I’m in Deep Purple going out for some incredibly posh dinner in Paris with 13 knives and forks on each side of the plate. I didn’t know what to do until I saw some other people begin from the outside and start working their way in! Ritchie, Jon and I are all looking away from the camera here, but I don’t know why. I spent an enormous amount of time with Ritchie, writing most of the stuff. Our relationship was pretty much him saying, ‘I wouldn’t do that if I were you.’ But we worked well together, as the legacy testifies. I have to say, though, that everyone in this photo was important to the identity of Deep Purple; Ian Paice with his unique drumming, Glenn with his outstanding voice, and Jon with his incredibly confident left hand. You can subscribe and/or order issues from the magazine’s website. 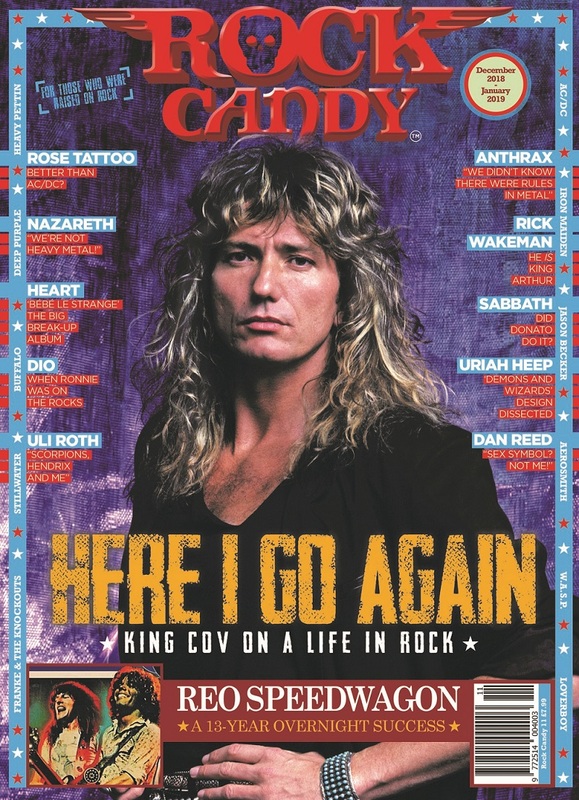 The first two pages sample of the Coverdale article (that conveniently for us cover his Purple years) is available as a free download. Posted by Nick Soveiko on Friday, November 30th, 2018, filed under News. You can follow comment on this post through the RSS 2.0 feed. You can skip to the end and leave a comment. Pinging is currently not allowed. Off..but Happy 73th birthday to Roger Glover! Happy Birthday to Roger!Nobody has posted about it on the site…what a shame. Maybe Rogor doesn’t want to be reminded. After 60 birthday celebrations stops. Also fans don’t want to be reminded that their favourite band is getting on a bit.